We spend around a third of our lives sleeping, but beyond comfort, many of us don’t give a second thought to what we’re sleeping on. This can be a huge problem, especially since modern mattress technology involves a whole circus of chemicals, fibers, and glues that could be potentially harmful to your health over years of exposure. That’s why we’ve put together this guide to show you how products like organic mattresses can reduce your exposure and prevent harmful side effects! What are you breathing into your lungs when you are sleeping on your mattress? Once upon a time, mattress makers looked to nature and made their mattresses from things such as cotton, wool, and wood. Then came the modern age and mattresses started being made with synthetic substances such as chemical foams, plastics, and other petroleum-based materials. 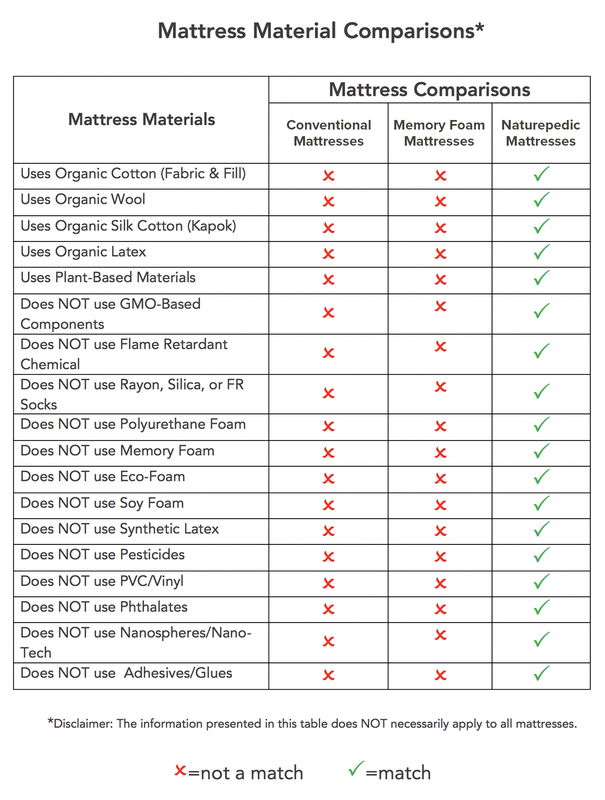 In most mattresses today, polyurethane foam is the single biggest component, to the point that in many mattresses, memory foam is basically the whole mattress. Today, no one asks the question: What’s inside a mattress? Most people sleep on a mattress every day, 7 days a week, 365 days a year. They never ask: Is my mattress affecting my health? The short answer is probably YES. There are many chemicals in today’s typical mattress. They are intentionally added to address flammability reduction, water-proofing, comfort, and bacterial growth. All mattresses have the potential to release toxic chemicals into the air via a process known as off-gassing. Basically, the chemicals in the mattress can evaporate into the air surrounding the mattress. For the chemicals which cannot off-gas, such as powders, they can dust-up and float in the air around the mattress. When you lay down on your mattress, the chemicals can surround you and you can breathe them in via inhalation. Total intake via the inhalation exposure route has been estimated to exceed intake via dust ingestion, indicating that inhalation is an important route that should be taken into consideration in assessments of these chemicals. Let’s focus on one group of chemicals, namely flame retardants. The earliest flame retardants, polychlorinated biphenyls (PCBs), were banned in the U.S. in 1977 when it was discovered that they were toxic. The manufacturers then used similar chemicals, which contained bromine rather than chlorine, and had the same flame retardant properties. Other chemicals used for flame retardance include brominated diphenyl ethers (PBDE) and chlorinated organophosphates (TDCIPP and TPHP). More than 90 percent of the adults and children in the Duke-led study had TDCIPP and TPHP, in their urine. On average, the levels of one of the chemicals, TDCIPP, were 17 times higher in adults in 2015 than they were in 2002. Nearly all Americans tested have trace levels of flame retardants in their body. Children are disproportionately impacted because of the size, resulting in higher concentrations of flame retardant chemicals in their blood than found in adults. This situation is even worse for infants and newborns because it is possible for the mother to expose their babies in utero. Tests of indoor media in homes, offices, and other environments have shown these compounds are released from products and have become ubiquitous indoor pollutants. Flame retardants, including organophosphates, are known to cause adverse health effects, with human and animal studies linking them to cancer, hormonal changes, and fertility problems. The results of the continuing Duke-led study indicate that organophosphates are following the same pattern as previously used flame retardants. How can you avoid flame retardant chemicals? Don’t bring them into your home. 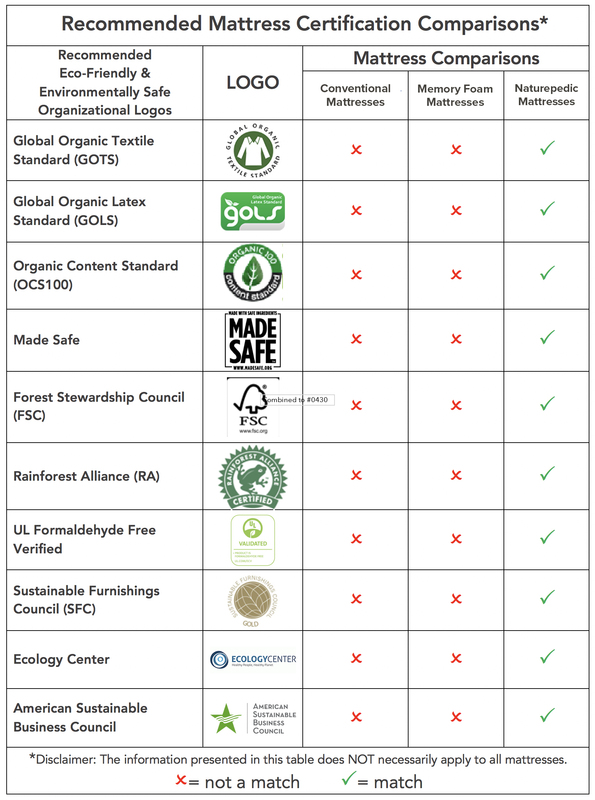 Sleep on a chemical free mattress, a certified organic mattress. Antibacterial – Refers to fabric that is either chemically treated or whose fiber is created with an antibacterial agent. An antibacterial treatment makes the fabric resistant to microorganisms and inhibits their growth. Bed Frame– The frame, usually made of metal or wood, which holds a bed’s foundation and maintains the headboard and footboard. Binding Tape– Fabric tape used to bind and close the mattress or foundation where the vertical and horizontal panels of outer ticking come together, providing the edge trimming for the mattress or foundation. See Tape and Tape Edge. Border Rod– A heavy gauge wire rod attached to the perimeter of the innerspring unit (top and bottom) by means of a helical wire or metal clips. Box Spring– Also referred to as a “foundation.” A base for an innerspring mattress, consisting of coils or other forms of springs mounted on a wood or metal frame and secured with a wire-interlaced or welded-wire grid. Chamber – A wall of fabric sewn inside the basic shell to create a compartment that separates filled portions from each other. Often used in comforters to keep fill in place. Coil – Springs used in a mattress and/or box spring to provide resistance to applied weight. Coil Count– The number of coils in an innerspring unit. Though the count can affect weight distribution, it is not the determining factor for firmness. The count is usually based on the number of coils in a full-size unit. Cotton – Natural fiber made from cotton plants. Cotton is the softest and most breathable fabric and is known to draw moisture away from the skin. Types of cotton include cambric, Egyptian, Percale, Pima and Supima. Cushioning – Materials that lie above the insulator and below the fabric covering in an innerspring mattress. These materials are typically combinations of polyurethane foam, cotton felt, and/or made-made fibers. Density – A measure of weight per cubic volume, usually expressed in pounds per cubic foot. Often referred to when discussing foam. Fabric Cover – Cloth or textile material woven, knitted or felted of any fiber or mixture of fibers. Often referred to as “ticking” or mattress fabric. Fill – Natural or synthetic material used to stuff bedding pieces such as comforters, pillows and mattress toppers. Firmness– Describes a mattress’ resistance to body weight and the resulting give. Gel Foam – Generally a visco-elastic foam containing “beads” or particles of semi-solid gel–also called “gel-infused foam.” Semi-solid, poured gel also can be used as a separate component in the comfort layer of a bed. Hammocking – An undesirable characteristic sometimes associated with worn out or low-end mattresses. When weight is placed in the center, the corners tend to rise and bow in response to deep compression much like a hammock. Hypoallergenic – A product that is largely allergen-free. Ideal Weight Distribution – Equalization of support in such a way as to eliminate pressure points that cause discomfort resulting in tossing and turning. Latex – A flexible foam created from a water dispersion of rubber, either from the rubber tree (natural latex) or a man-made, petroleum-based product (synthetic latex). Mattress – A manufactured product to sleep on, consisting of various resilient materials covered with an outer ticking. Comes from the Arabic term “matrah” meaning to throw down. Early Arabs traveled with their bedding and threw it down on the ground or floor at night. Mattress Topper – A layer of support that lies on top of a mattress (for example, a featherbed, fiber bed or foam topper). Memory – The ability of tempered steel, foam or some fabrics to return to their original state after being compressed or stretched. Memory Foam – A type of elastic, viscous synthetic foam that molds to the shape of whatever surrounds it. Mercerize – Treatment used to shrink fibers and thereby increase a fabric’s strength and luster. Micro-coils – A low-profile metal spring unit, typically with individually wrapped coils, used in the top comfort layers of a mattress. Open Construction – Comforter construction in which the fill can move between chambers. Panel – The part of the ticking that constitutes the top sleep surface of a mattress, as well as the bottom of a mattress on a two-sided bed. Pillow-Top Mattress – A mattress featuring a surface finishing treatment where a separate encasement of soft materials is attached to the entire surface on top of existing cover and upholstery. Pocketed Coil – See Marshall. Polyester – Synthetic fiber that is durable, non-breathable, wrinkle- and shrink-resistant. Polyurethane Foam – (Urethane Foam) – Synthetic chemical flexible polymer foam used for mattress cores and as a cushioning material. Also known as memory foam, visco-elastic foam, soy-foam, eco-foam. Support – Refers to a mattress’ stability and how it distributes body weight. Tape – Fabric material that closes over the rough-sewn edge where the top and bottom panels are joined to the border of a mattress or box spring. Thread Count – The number of threads in one square inch of cloth. A high thread count results in a finer weave and can increase durability. Ticking – Fabrics for covering mattresses and foundations. Also known as mattress fabric. Common types include: stretchy double knits, woven damasks, woven upholstery-style fabrics, knits and nonwovens. Ventilator – Metal or plastic screens attached to the sides and sometimes the ends of mattresses to permit the passage of air. Visco-Elastic Foam – Also known as “memory foam.” Slow recovery urethane foams that are temperature sensitive. They conform to the body and distribute pressure according to body heat and dynamics. Wood Frame (for box springs) – The wood frame in a box spring on which the spring construction is mounted. Information for this page was brought to you by our sponsor, Naturepedic.